Habbo Police™ Need help - Ask away! The Producers, Judges, Host and Contestants only access to backstage with American Idol Backstage Pass. New Year 2018 Party: Official Host - Didcot. A group of "vocal gladiators" battle for stardom. These super-talented and fiercely competitive singers try to defend their coveted spots on the stage, as they are challenged individually by new singers determined to replace them. Club Neon, a friendly and new brand clubbing coming to Habbo! Enjoy the experience! Didcot owns the office under the vila owned by Didcot. Got the real swag up in here! THE EVENING WITH DIDCOT FANS! Always Follow The Habbo Way! The Ultimate Fighting Championship is an American mixed martial arts promotion company. It is the premier MMA promotion as well as the largest in the world, featuring most of the top-ranked fighters in the sport. Habbos with this badge are a member of the Habbo Police™ group. They work to ensure the Habbo environment is safe. Police with a bronze badge are in-training. Habbo Police™ is unofficial and has no link to Ambassadors. Habbos with this badge are a member of the Habbo Police™ group. They work to ensure the Habbo environment is safe. Police with a gold badge are Police Leaders. They hire and train police. Habbo Police™ is unofficial, and has no link to Ambassadors. The members of Team Didcot in The Voice USA: 2018 All Stars. Habbos with this badge are a member of the Habbo Police™ group. They work to ensure the Habbo environment is safe. Police with a silver badge are fully qualified police officers. Habbo Police™ is unofficial, and has no link to Ambassadors. The members of Team Noah in The Voice USA: 2018 All Stars. This badge is for Habbo Police™ staff to gain access behind the counter at the Habbo Police™ Station and to have access to the forum. This badge is not to be worn. Habbo Police™ is unofficial, and has no link with Ambassadors. Backstage Pass for The Voice UK. The Number One Megastar on RAW Live. Arrogant and over-confident. He will do whatever it takes to get to the top, no matter who is back-stabbed in the process. El Fuego is a world famous luchador hailing from Mexico City. Famous for his quickness and high flying ability, he looks to use his speed to his advantage. For fans of The Voice USA. Hosted by Wizzeed. 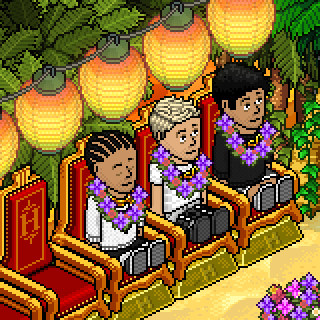 Coaches: NoahKaden, Didcot & HasanJai. See Group Forum for all the latest news or Twitter @TheVoiceHabboUS. The members of Team Hasan in The Voice USA: 2018 All Stars. To be launched this Summer! This group is open to Habbo Helpers and Guardians. Established in 2015, this group caters to the members of Habbo.com who go above and beyond in keeping the Hotel a safe and fun place to hang out in. Wear your Helper/Guardian badges to be accepted! Habbo X Factor - Producers Hallway. The office of the VIP Police Officer, Didcot at Habbo Police™ Help Centre. Club Neon a friendly and new brand clubbing coming to Habbo! Enjoy the experience! Pick up SIX valuable trophies! BACKSTAGE - Evening With Didcot! Owned by Didcot. Linked to O2 Arena owned by Multisionous and CalltheShots. Taken in this room on 31 March 2018 and received 2 likes. Taken in this room on 18 December 2017 and received 1 likes. Taken in this room on 16 December 2017 and received 5 likes. Taken in this room on 16 December 2017 and received 2 likes. Taken in this room on 5 June 2016 and received 3 likes. Taken in this room on 5 June 2016 and received 2 likes.